I was either a really weird kid when I was little or I had great panache, wearing my huge fuzzy turquoise earmuffs while baking brownies. Probably being a really weird kid is a more accurate description. There’s a photograph of this moment, me with a bowl of chocolate brownie mix, with brownie-batter-smeared cheeks on either side of my toothless grin. The final baked product was never nearly as much fun to devour as the goodness of bowl-licking batter. But then I made these brownies. Not from a mix, not with unknown sugary things, not with the Hershey’s fudge sauce packet that you get to squeeze into a powdery concoction. No. 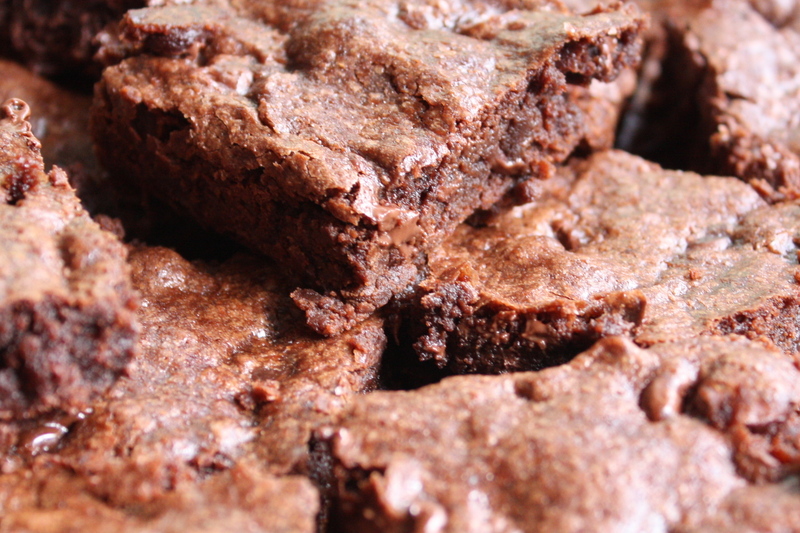 These are pure, fudgy, chewy, chocolately brownies that, when baked, taste just as good as the batter, if not more. The secret? A quarter teaspoon of instant coffee powder. You can certainly add walnuts or more chocolate chips. However I was delighted in the simplicity of these brownies, no added flavors necessary. Preheat oven to 350 degrees. In a large bowl, mix both sugars, salt, coffee powder, cocoa powder, and flour. Then, add eggs, melted butter, oil, and water. Fold in chocolate chips. In a greased 9″x13″ pan, pour mixture and bake for about 25 minutes, or until a toothpick comes out clean when inserted into brownies.